NEW YORK (Reuters) - Broad stock declines in Europe and the United States dragged world equity markets lower on Monday, adding to a sell-off that has sent global stocks near 17-month lows. The MSCI world equity index <.MIWD00000PUS>, which tracks shares in 47 countries, slipped 0.7 percent as declines in U.S. and European markets <.STOXX> offset modest gains in Asia <.MIAPJ0000PUS> overnight. Wall Street's Dow Jones Industrial Average <.DJI> fell 325.9 points, or 1.35 percent, to 23,774.61, the S&P 500 <.SPX> lost 28.84 points, or 1.11 percent, to 2,571.11 and the Nasdaq Composite <.IXIC> dropped 75.77 points, or 1.1 percent, to 6,834.90. The Russell 2000 index <.RUT> of small-cap U.S. companies, meanwhile, fell 1.2 percent, pushing the index into the 20 percent decline from its highs that signals a bear market. "If Santa Claus doesn't turn up very soon, U.S. stocks may end this year in negative territory", wrote Rabobank analysts as the Nasdaq remained the only benchmark in the black for the year, with the Dow and the S&P 500 down between 2 and 3 percent. In Europe, benchmark indexes from London and Milan to Paris and Frankfurt have lost between 10 percent and 17 percent so far this year. Some investors had hoped for a bounce back before the holidays, but any "Santa Claus rally" has proven elusive so far. 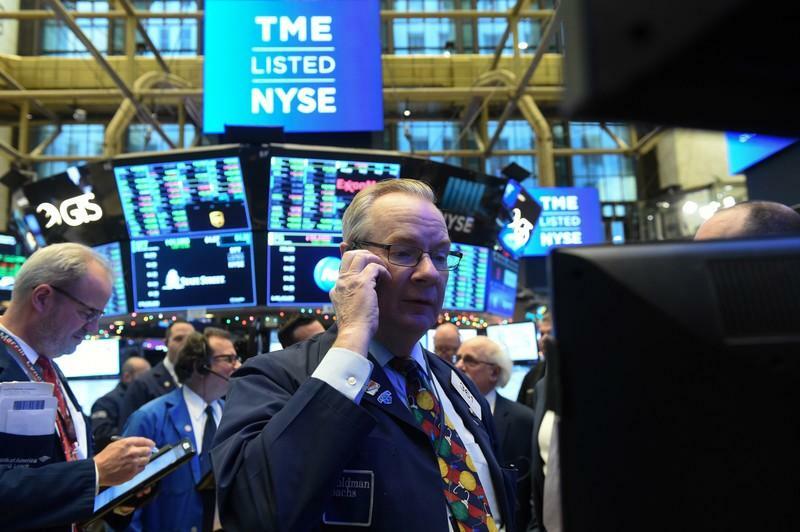 Since 1950, Wall Street has rallied by an average of 1.3 percent during the last five trading days of December, according to the Stock Trader's Almanac. "Some investors whom we have spoken to had positioned themselves for a December rally and the path has been painful," broker Bernstein said in a research note. The Federal Reserve is widely expected to raise U.S. interest rates again at the end of its two-day meeting on Wednesday, but what matters more for investors will be whether it cuts its guidance on rate increases in 2019. The U.S. central bank now projects three more increases before 2020, but recent weak data and worries over Washington's protectionist policies have fuelled expectations the central bank will cut its guidance. In China, where the economy has been losing momentum, investors will look to a speech by President Xi Jinping on Tuesday marking the 40th anniversary of China's "reform and opening" policy. The top decision-making body of the Communist Party, the Politburo, said last week that China will keep its economic growth within a reasonable range next year, striving to support jobs, trade and investment while pushing reforms and curbing risks. In foreign exchange markets, moves were moderate. The dollar paused near 18-month highs before the Fed meeting, after it gained from a rush into safe-haven assets due to the economic outlook. The dollar index <.DXY> fell 0.36 percent, with the euro up 0.42 percent to $1.1355. U.S. benchmark 10-year Treasury notes last rose 8/32 in price to yield 2.8624 percent, from 2.889 percent late on Friday. Oil prices fell about 1 percent on signs of oversupply in the United States, with investor sentiment under pressure from concern over the prospects for global economic growth and fuel demand.